So, it’s been a while hasn’t it??? I just want to thank those of you (if any) who still come to my blog. lol! Anyways, I’ve suddenly had the inspiration to write again..
As some of you may know, the antelopes of the natural world have always had a soft spot in my heart. It might be because of the grace and poise they carry themselves with. Or how they, as with all herbivores, always seem to be the underdogs of the animal kingdom. I’ve always been particularly fascinated with the Hippotraginae family, primarily with the Sables. It’s probably because of this that I’ve never really tried to write anything about them. There’s just so much I would like to say! About how they (antelopes in general) are always overlooked when it comes to conservation efforts etc. and the fact that it’s commonly assumed that their primary role in live is to be part of a predator’s menu. Tell me; how many people can say they’ve heard of a hirola, Lichenstein Hartebeest or the Black-Faced Impala. So anyways, I decided to give it a shot and write about one of my personal favourites; The Giant Sable. The Giant Sable Antelope is the national emblem of Angola and is commonly seen printed on Angolan banknotes, stamps and even passports. Even the Angolan national football team is named after this animal; Palancas Negras. However, the irony lies in the fact that probably a majority of the population have never laid their eyes on a living, breathing specimen. This does not come as a surprise considering that the Giant Sable is currently listed as “Critically Endangered” by the IUCN. Perhaps it is quite safe to say that the Giant Sable is probably one of the least known large mammals of Africa. It is found only in Angola, endemic to the region between Cuango and Luando rivers where it usually inhabits the miombo woodlands. It is a subspecies of the common sable antelope, which contradictory to its name, is not as common as some might think. As with most antelope species, both sexes of the Giant Sable bear horns and these can be especially impressive on the bulls. Ridged and curved backwards, they can reach up to 5 feet in length. Bulls are usually darker in coloration, achieving jet black when they fully mature. It is part of the Hippotragus family where in Greek, ‘Hippo’ means horse and ‘Tragus’ means goat. This is an apt description of the Giant Sable as it seems to have features of both animals. The Sable Antelope is famous for being notoriously aggressive, at least within the antelope kingdom, where flight is usually the main line of defense. 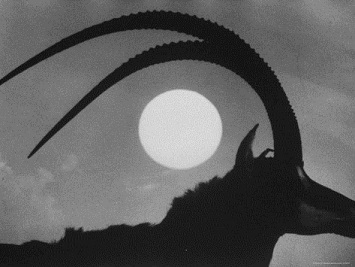 They frequently back themselves against bushes and then sweep its curved horns back and forth whilst on its knees in an attempt to deter a predator. Sables have even been known to repel lion attacks. The Giant Sable’s history has been fraught with peril. Sought after by trophy hunters upon its discovery, it was then trapped in a 27-year civil war where it served as bush meat to the armies. As such, fears of it being wiped out are not unfounded until recently. The saying that “every cloud has a silver lining” seems to be true as a small population of these animals was found in the early 2000s. Subsequently, a programme was launched to monitor these animals in hopes of protecting the handful of survivors from poaching. This was achieved through a combination of traditional tracking methods on foot as well as the use of high-tech camera traps. Just when it seems like there’s hope, the cameras reveal a worrying sign. Hybridization. Due to the lack of prime Giant Sable bulls from poaching, it seems like the females are mating with Roan Antelope bulls, a cousin of the Giant Sable and member of the Hippotraginae. So one may think; what is so important about the Giant Sable when there’s other stuff to care about? Just in case the words “Critically Endangered” do not mean anything, this antelope is finding itself on the verge of extinction once again. Other than threats of poaching, the fact that Angola is the world’s fifth largest diamond producer means that there is constant pressure for mining. This means a lessening of the already dwindling habitat preferred by the animal. Furthermore, with the dangers of hybridization looming, it is feared that the pure line of Giant Sable would be lost gradually. As of March 2013, there is an estimate of only a hundred individuals left. This cycle of Giant Sable recovery and then finding itself on the verge of extinction once more has to end. If recent news are what we have to go by, then it seems highly likely that the cycle will indeed come to an end, and it’s not favourable for the Giant Sable. Despite efforts from the Angolan authorities to protect them, there is just not enough word out there about the Giant Sable. More often than not, it finds itself lost in the shuffle to the big-shots of the animal kingdom, specifically when it comes to conservation efforts. Even books that list the most endangered species seem ignorant of its existence. To end, it does not really matter whether one can a make a difference to the survival of a species or not. What’s most important here is about being aware. Ignorance is definitely not bliss. Who knows what we can do for the Giant Sable other than the occasional donation? (Google Tusk-Trust) Even I am unsure of what I can do to help other than to spread word about its existence. What I’m hoping to achieve through this piece is not a revolutionary work that will garner support and somehow miraculously, swing the tide in favour of the Giant Sable. All I know is that if people don’t know about something, then there’s nothing they can do about it. So, hopefully, through this article, each time Africa comes to mind; remember that it’s not only lions, elephants and rhinos that need our help. There’s an animal out there that needs just as much help as they do. The Giant Sable Antelope. Anyways, here’s a pic of my Sable collectibles! Lol! Yeah, still a child no? 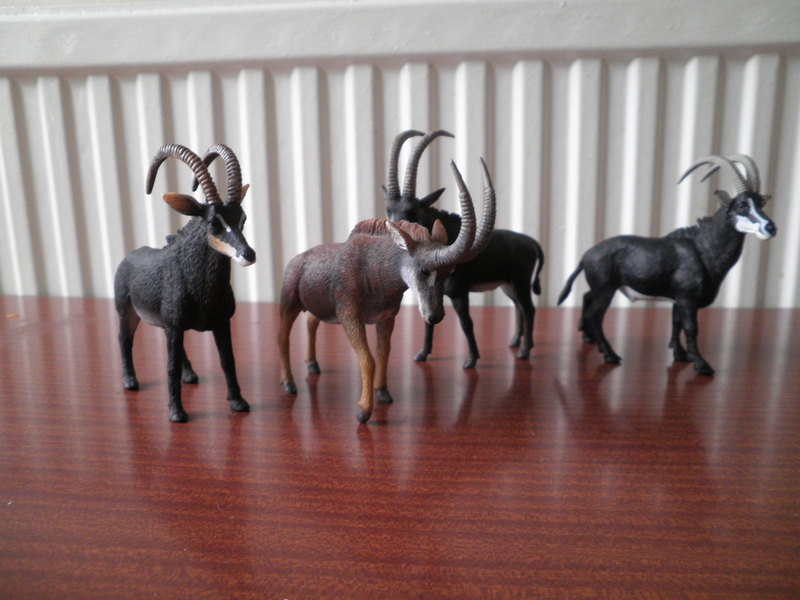 There are 3 Giant Sables and 1 Common Sable, 3 bulls and a cow. Guess which’s which?